RN Salary In Texas | What's The Nursing Salary In Texas? Understanding the RN salary in Texas is important for prospective nurses seeking employment. It''s also important information for students looking to pursue a degree at one of the many nursing schools in Texas. In this article we will reveal how nursing salaries in Texas compare with that of the rest of the nation. 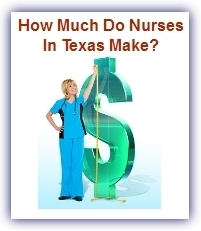 In examining the nursing salary in Texas, the first factor for consideration is the educational level of the nurse. An LPN for example is generally going to earn less than an RN, who has two more years of educational experience. Obviously the more advanced the degree, the higher the pay. Location is also an important factor for nursing salaries in Texas. Highly populated areas such as Dallas/Fort Worth or Houston will tend to pay higher than rural, sparsely populated areas such as small towns. The starting nurses’ salary in Texas for RNs is roughly $28,000 per year, depending on the location, which varies between rural and urban areas. Plus, there are differences between hospitals and private care which are typical for salaries in any state. The average median nursing salary in Texas for a RN in Dallas is around $65,000. This figure is generally a little less than the national average by around $1,500. But it also must be pointed out that Texas has no personal income tax and the cost of living falls in the middle of what can be found in the country. This makes it likely that a nurse in Dallas may keep more of his or her salary than in California for example. For those with more education, an Advanced Practice Nurse in Texas has an average base of almost $95,000 per year, which ranks it among the highest in the nation. For those wishing to pursue a lifetime career in nursing, becoming an APN is a highly desired position which offers better pay in a managerial position. How Many Hours Does A Nurse in Texas Work? How much a nurse gets paid is one area, another is how many hours a typical nurse in Texas works per week. The hours can vary depending on the nature of the institution that hires the RN, but generally speaking they work no more than 12 hour shifts and are limited to 60 hours a week if possible. A series of studies evaluated by the governing board for nurses in Texas came to that conclusion in 2007. With that consideration, a nurse can be expected to work overtime up to a 60 hour work week in many hospitals or other similar health institutions. So the overtime pay has been included in the average that a nursing salary in Texas is expected to be. Bottom line, the more experienced and educated the nurse, the higher the pay should be. The key to maximizing your RN salary in Texas is to continue the education process and earn the advanced degrees that are highly in demand.